This Sunday we continue our series on ‘Romans: The Heart of Truth’, with Jodie speaking on the topic ‘Together for the Gospel’ from Romans chapter 15 verses 14 to 33. This will be Jodie’s final sermon as our Senior Minister. At both our 10am morning and 5pm evening service, we will have a special time of farewell and prayer for Jodie and his whole family as he finishes up his ministry with our church. 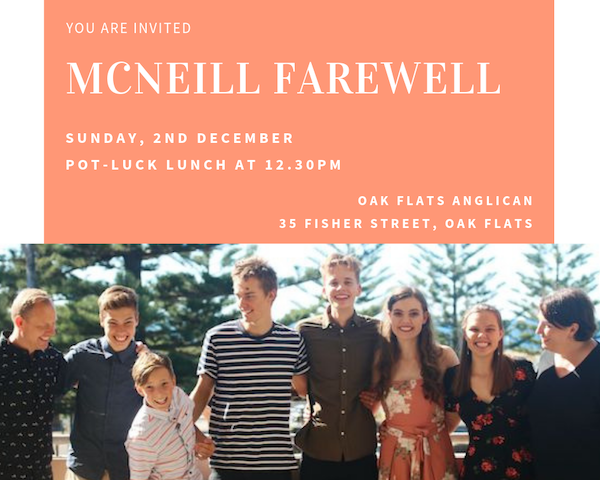 Please join us from 12.30pm for a pot-luck lunch to officially farewell the McNeill family.